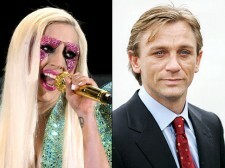 License to thrill: Get ready, Daniel Craig, Lady Gaga may croon the next James Bond theme song. “Bond bosses are all huge Gaga fans,” says an insider on the upcoming flick. “Her sound and sense of drama make her the top choice.” Gaga isn’t the only lady who may be on board with Craig: Rumor has it that Oscar winner Rachel Weisz has been tapped to play a villain.